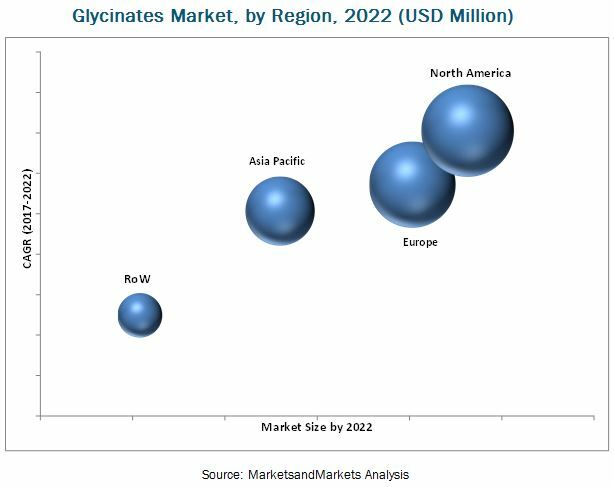 [131 Pages Report] The glycinates market was valued at USD 878.1 Million in 2016, and is projected to grow at a CAGR of 5.89% from 2017, to reach USD 1,234.3 Million by 2022. The base year considered for the study is 2016, and the forecast period spans from 2017 to 2022. 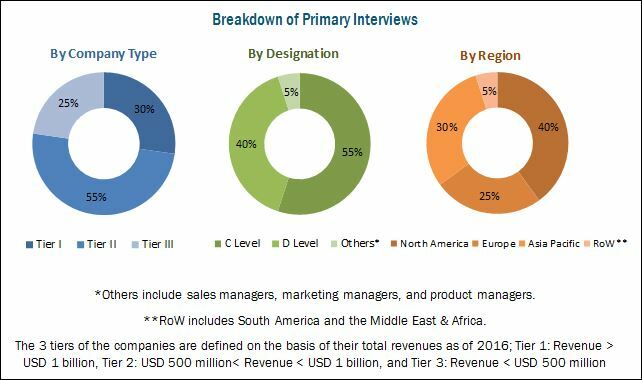 The basic objective of the report is to define, segment, and project the global market size of the glycinates market on the basis of type, form, application, and region. It also helps to understand the structure of the market by identifying its various segments. The other objectives include analyzing the opportunities in the market for stakeholders and providing the competitive landscape of market trends, the supply chain of this market, and projecting the size of this market and its submarkets, in terms of value and volume. This report includes estimations of the market size in terms of value (USD million) and volume (KT). Both top-down and bottom-up approaches have been used to estimate and validate the size of the global glycinates market and to estimate the size of various other dependent submarkets in the overall market. The key players in the market have been identified through secondary research, some of the sources are press releases, paid databases such as Factiva and Bloomberg, annual reports, and financial journals; their market share in respective regions have also been determined through primary and secondary research. All percentage shares, splits, and breakdowns have been determined using secondary sources and were verified through primary sources. The figure below shows the breakdown of profiles of industry experts that participated in the primary discussions. Key participants in the glycinates market are the glycinates manufacturers, suppliers, and end users. The key players that are profiled in the report include BASF (Germany), Solvay (Belgium), Ajinomoto (Japan), Clariant (Switzerland), and Albion Laboratories (US). Other players include Shijiazhuang Donghua Jinlong Chemical (China), Galaxy Surfactants (India), Novotech Nutraceuticals (US), Schaumann (Germany), Dunstan Nutrition (New Zealand), Aliphos (Belgium), Chaitanya Chemicals (India), and Provit (Poland). The glycinates market is estimated to be valued at 927.2 Million in 2017, and is projected to reach a value of USD 1,234.3 Million by 2022, at a CAGR of 5.89% during the forecast period. The global demand for glycinates is increasing significantly due to the growing demand for nutritive food products. The market is further driven by factors such as increasing deficiency of minerals among the population, especially in developing countries such as Brazil, growing demand for chelated minerals in food additives, and growing restrictions on the use of antibiotics in livestock feed. On the basis of type, the glycinates market was led by the magnesium glycinates segment in 2016. Magnesium plays a vital role in the body's detoxification processes, as magnesium glycinate increases bioabsorbability and has a significant application in dietary supplements. The glycinates market, on the basis of form, is segmented into dry and liquid. The dry segment is estimated to account for the larger market share; this can be attributed to several benefits associated with this form, including lower costs, along with the convenience of usage in a wide range of applications such as food, feed, pharmaceutical, and personal care. The glycinates market, based on application, is segmented into pharmaceuticals/nutraceuticals, food additives, feed additives, and personal care products. The feed additives segment covered the largest market share. Increase in the focus of manufacturers on animal feed with increased opportunities in the dairy and meat industries is one of the key factors for the consumption of glycinates in animal feed. Furthermore, incorporation of various ingredients in animal feed by manufacturers for improvement in the quality of meat has increased the demand for glycinates with glycine being the most widely used chelates in the market for chelated feed minerals. North America is one of the largest markets for feed production, and therefore, a significant amount of glycinates are being consumed in the region. This results in a significant demand for glycinates for the feed application in the region. Europe and Asia Pacific are the dominant regions in the glycinates market. The developed personal care industry has created lucrative opportunities for glycinate manufacturers in Europe with the presence of major players such as Solvay and Clariant operating in the personal care space, to cater to the increasing demand for personal care products in the region. Furthermore, major countries contributing significantly toward the growth of the Asia Pacific region include China, Japan, India, and Australia & New Zealand. The increasing demand for animal products in developing countries contributes to the growing demand for glycinates in the Asia Pacific region. The increasing demand for fortified food agents is further expected to further boost the glycinates market in the region. The major restraining factor for the growth of the glycinates market is the high R&D costs associated with the new product development of chelated mineral glycinates. Companies such as BASF (Germany), Solvay (Belgium), Ajinomoto (Japan), Clariant (Switzerland), and Albion Laboratories (US) collectively account for a share of more than half of the glycinates market. These companies have a strong presence in Europe and Asia Pacific. They also have manufacturing facilities across these regions and a strong distribution network.